Chester dropped out of the play-off places following Saturday’s 2-0 defeat at Spennymoor Town. Gary Roberts missed a second half penalty that could have brought the sides level at the time. Ryan Hall gave Moors the lead on 31 minutes picking up a flick on by Glen Taylor before rounding Grant Shenton to shoot into the empty net. The Blues were handed a lifeline ten minutes after the break as a foul on new signing George Waring saw referee Bell point to the spot. Roberts saw his penalty saved by Matthew Gould in the home goal with substitute George Green heading the rebound over. Taylor wrapped up the three points 11 minutes from time picking up a loose ball just outside the box, beating two defenders before shooting past Shenton. Chester have signed former Tranmere Rovers George Waring until the end of the season. 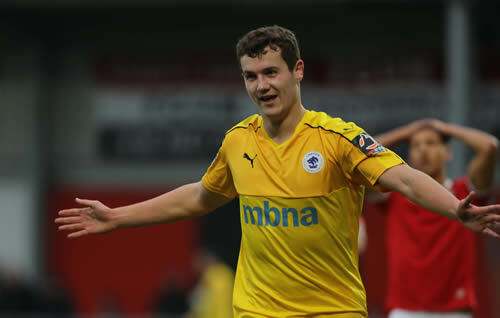 The 24-year-old Chester born player has recently had a loan spell at Kidderminster Harriers. Waring actually started out his youth career with the Chester City Academy before moving to Everton and then Stoke City. Waring had a loan spell at Barnsley in League One during the 2014/15 season, scoring six goals in 19 games for the Tykes. He has also had loan spells at Oxford United, Shrewsbury Town and Carlisle United before signing for Tranmere in 2017. Jon Moran has joined Hednesford Town on a one month loan. The 21-year-old defender signed from Forest Green Rovers in the summer and has scored one goal in 18+4 appearances for Chester this season. Chester have signed winger Ben McKenna from Bradford (Park Avenue). The 26-year-old scored for the Avenue in their 5-3 defeat at Chester earlier in the season. He began his career as a youth player at Burnley and has also played for Carlisle United, Stockport County and Curzon Ashton. Chester have been drawn away to Nantwich Town in the quarter final of the competition. The Dabbers won 2-1 at Crewe Alexandra in the last round. The match is due to take place in the week commencing 9 February. Chester have signed experienced 31-year-old midfielder Sean McAllister ahead of Saturday’s home game against Guiseley. He has previously played for Sheffield Wednesday, Scunthorpe United and Grimsby Town. He had a loan spell at York City last season and has been training with Chester this week. Both Gary Stopforth (pictured) and Akwasi Asante will be out of action for some time. The club have had scans back on both players today, Stopforth requires surgery for a torn meniscus in his knee while Asante could be out for up to another four weeks recovering from his knee injury. Two goals from Nathan Brown plus strikes from George Green and Iwan Murray gave a youthful Chester side a 4-0 victory at Winsford United in the first round of the Cheshire Senior Cup last night. Goals from Anthony Dudley and Gary Roberts gave Chester a 2-0 victory at FC United of Manchester on Saturday. It as the first away victory since September! The Blues were reduced to ten men midway through the second period with George Green receiving a second yellow card. Chester moved into fifth position following the victory. Dawson has since joined League Two side Macclesfield Town. The club have also announced that Academy graduate Iwan Murray has extended his contract at the club until the end of the season, he had initially signed a six month deal last summer. 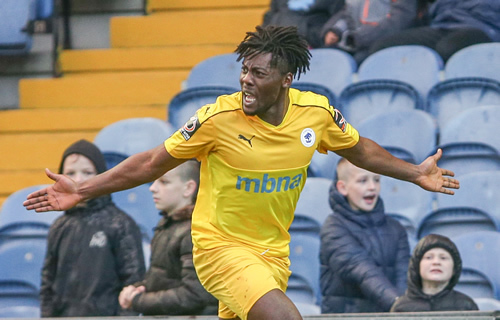 It’s the news Chester fans have been waiting for and this afternoon the Blues have finally announced the signing of 26-year-old Dutch forward Akwasi Asante from Tamworth on an 18 month contract. Asante scored five goals in three games during his recent loan spell that was cut short through injury, and he joins after the Blues paid a club record undisclosed five figure fee for his services with the deal made possible thanks to the financial support of businessman Stuart Murphy, who recently donated £1m to the club. Asante passed a medical prior the home game with Southport on New Years Day and signed later that day, he’s expected to be fit for the all-ticket match at FC United of Manchester on Saturday, kick-off 15.00hrs.